The Halabja massacre, which has left a black stain on the history by the hand of the Western subcontractors, retains its freshness in memory despite the past 31 years. 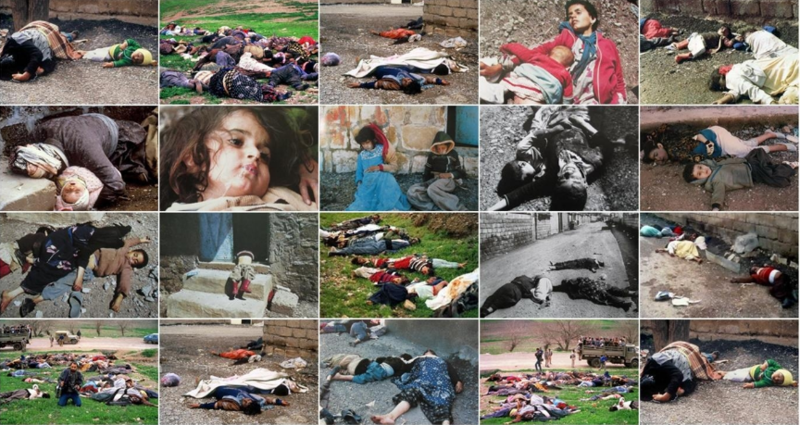 Thousands of oppressed Muslim Kurdish people were targeted by Saddam Hussein's command in the Halabja massacre on March 16, 1988, which left a black stain on history by the hand of the Western subcontractors. Children fell on the ground like sparrows after shouted, "(Daye behna sêvê tê) Mom, there is a smell of apple". This massacre dates back to the wildest massacre after Hiroshima and Nagasaki. Despite the fact that 31 years have passed since the massacre, where the whole world remained silent, the atrocities and massacres of that day remain in memory. The last period of the Ottomans…The imperialists, who resembled a flock of wolves plunged into the Islamic lands, have divided Kurdish land into four pieces on the new map they have determined as they punished the Kurdish people, faithful people, for not obeying the imperialists. This initiative, which started with the Sykes-Picot Agreement and ended with Lausanne, was also opening the door to a Kurdish issue in every part they have divided. The Kurds were subjected to the oppression of the Socialist-Baathists in Syria and Iraq, secular-Kemalists in Turkey, and the Shah regime in Iran. Muslim Kurds, who have been deprived of their human rights, have suffered throughout history in these four parts. In 1979... The French National Socialist Malik Eflak's student and also his intellectual son, Saddam Hussein Al-Tikriti took over the power in Iraq. The Kurds in Iraq were faced with many problems, especially with assimilation policies during the Saddam era. Right at that time, the revolution that took place in Iran, right next to Iraq, ended the existence of Shah Reza Pahlavi, another puppet of the West in the region. The West, which was in danger of losing its puppets, has launched a war against Iran by putting Saddam on the line. This war between Iran and Iraq lasted 8 years. The Kurds, who have been living under Saddam's pressure for years, have set a stand for Iran in this war. Saddam appointed Ali Hassan Al-Mecit, nicknamed Chemical Ali, as the commander in charge of the Kurdish region. Chemical Ali rained a chemical bomb on Halabja city and its villages in the context of the brutal operation in the Kurdish region. These chemical bombs killed more than 5,000 people and injured more than 7,000 people. Thousands of people had to leave their homes and emigrate. Death fell like a dark cloud on the people of Halabja. Halabja turned into a death field with corpses piled up on top of each other, rotten human bodies and children who had lost their lives with their mouths open. People were in shock, did not know what to do. Some of them, along with their family, were walking around in the street, trying to maintain their routine life. But the poison suddenly spread all over their bodies. They were unaware that death would catch them all of a sudden. The chemical weapon used consisted of mustard and sarin gas, which caused great damage to the skin, eyes, throat, and lungs. Those who inhaled apple-scented chemical gas were surrendering to this venom. "Unlike ionizing atoms in Nagasaki and Hiroshima, mustard gas is also incredibly damaging for the future generation," says experts while expressing the effects of the mustard gas. "It especially has damage on DNA in the long term." The whole world has witnessed people dying slowly suffering because of the gas that melts the human body, causing the nervous system to collapse and the breaking of the backbone. Halabja experienced one of the most painful days in human history. In the massacre of Halabja, first people died and then humanity died. The number of people killed in the attacks continued until 17 March is still unclear. The common result accepted by many organizations; at least 5 thousand people are killed, mostly women and children. At least 14 thousand 765 people were injured. However, foreign observers who went to town after the war say that the number is much higher. Why Halabja was the target? Of course, it should not be ignored that the Western powers, which did not tolerate the Kurds to be a religious people, have used chemical weapons in Halabja, where the Islamic movement was strong. Halabja was also the center of the Islamic organization there. At the head of the Islamic Movement, which was the third power at that stage, there was Sheikh Osman, called Abu Halabja. The Kurdistan Islamic Movement had considerable armed power. In addition, it was growing day by day. This attracted the attention of both Saddam and Westerners. Throughout his rule, the Saddam regime has found an Islamic cover for all the attacks on different groups and forces, especially Shiites and Kurds. The Ba'ath regime, which gave the name 'Kadyushiye' to the war against Iran and the massacre it conducted against the Kurds, called the 'Enfal', issued special fatwas for all operations and executions.